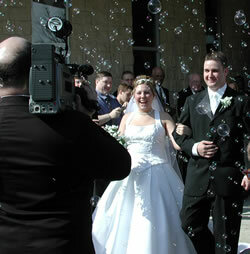 The glass for a Basic Wedding Hourglass is calibrated to a running time of 60 minutes +/-. 9" high solid hardwood cases in which to have your glass mounted. Personalized laser engraved messages of your choice on both end-caps are included. Instructions for submitting materials for laser engraving will be sent by e-mail shortly after I receive your order. For one side you could choose to have your entire wedding invitation, your wedding vows or another personal message. On the other side perhaps the names of the Bride and Groom along with the wedding date. In-house custom laser engraving allows you to have many options with few restrictions.